In his maiden speech to the NI Assembly newly elected MLA Doug Beattie thanked everyone for their kind words after his baby grandson Cameron died during the election. He criticised the Fresh Start Agreement describing it as a ‘whimsical document’. “It sets an agenda for the next five years but does not give a long-term vision for Northern Ireland in the next 20 or 30 years. In fact, there may even be some in government who do not want Northern Ireland to have that long-term future. “A safe community is one where paramilitary groups and criminal gangs cannot exert influence”. “Where are the indicators to address that? In fact, the Executive — I have to say that the Ulster Unionist Party was part of the Executive and is not without blame — are sustaining paramilitarism in this country. Looking to the future, I can see us sustaining it for another five years. We have semi-autonomous paramilitary wings at Her Majesty’s Prison in Maghaberry. “We allow that to happen. We sustain it. We give it credibility. We give it an identity. We are giving it structure. We are allowing them to direct terrorism, and, if anybody thinks that that is not true, you just have to look at the brutal murders of prison officer Ismay and prison officer Black. Where are the indicators to deal with that and to stop the segregation and treat those people as they are: criminals to be dealt with as criminals? “Look at it from a more basic level and at the illegal paramilitary parades on our streets. Indeed, in my area of Upper Bann, in Lurgan, there were men, women and children dressed in paramilitary uniforms. I commend the Police Service of Northern Ireland for how it dealt with them during and after the parade, but the damage is already done because those paramilitary parades are influencing our children. Where is the indicator to deal with that? 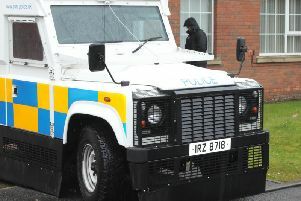 Before some of you people sitting here roll your eyes at me on this, let me remind you that paramilitarism affects far more of our outcomes, such as our international standing in outcome 10; an effective justice system in outcome 11; division and segregation in outcome 12; and effective and reliable public services in outcome 13. Those are all affected by paramilitarism, yet we have not, in this document, addressed it with any indicators whatsoever.